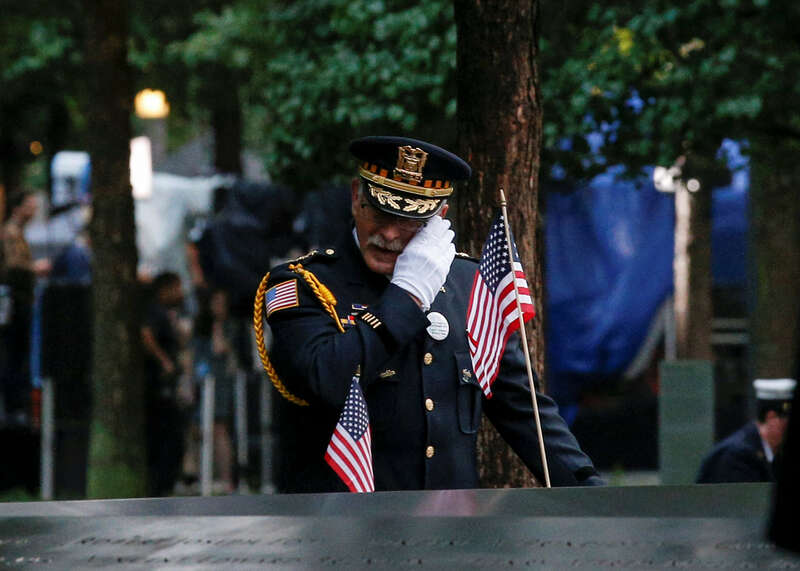 Photo Credit: CNS/Brendan McDermid - An officer mourns at the National September 11 Memorial and Museum during ceremonies Sept. 11 marking the 17th anniversary of the attacks in New York. Nearly 3,000 people died in the attacks in New York City, Shanksville, Pennsylvania, and at the Pentagon. President Donald Trump spoke at anniversary ceremonies at the Flight 93 National Memorial near Shanksville. Vice President Mike Pence addressed a crowd at the Pentagon. It was there that the body of Father Mychal Judge, the fire department chaplain, among the first to die in the attack, “was reverently placed upon the altar.” The Franciscan priest died ministering to victims in the rubble of the World Trade Center.